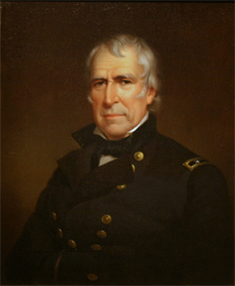 As a 40-year military officer, Zachary Taylor had never held any political office prior to becoming President of the United States. Reportedly, he had never spoken publicly about his political beliefs, nor had he ever voted. Ironically, he did not even vote in his own election since his constant moving precluded him from ever establishing legal residency in any one place. Taylor was born in Orange County, Virginia, and was one of nine children. 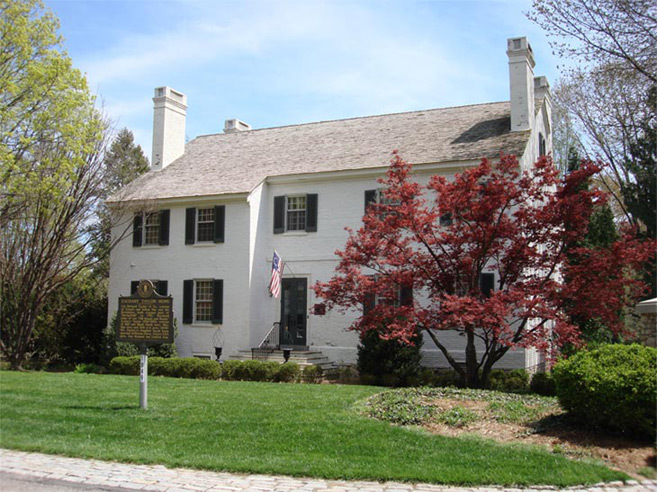 His father, Richard, served in the American Revolution under General George Washington. A second cousin to James Madison and a distant relative to Robert E. Lee, he lived on the Kentucky frontier and never went to a formal school. Instead, he was taught by tutors hired by his father. In 1808, at the age of 23, young Taylor joined the U.S. Army, something he had envisioned for himself even as a child. He began his career as a first lieutenant and was subsequently promoted to the ranks of major, captain, lieutenant colonel, and colonel while serving first in the Indiana Territory and in the War of 1812, as well as in a succession of Indian uprisings at frontier areas during the 1820s and 1830s. The boyhood home of Zachary Taylor, located near Louisville, Kentucky, where he spent many Christmas holidays with his seven brothers and sisters. In 1837, just before the Christmas season, Taylor was ordered to report to the Lake Okeechobee area of Florida to help put down the Seminole Indians. The Battle of Lake Okeechobee, fought on Christmas Day, was a hard-fought battle from which Colonel Taylor’s forces emerged overwhelmingly victorious. Certainly, 12 years later, President Taylor – if he was inclined to send out White House Christmas cards to those he vanquished – would only need to send out a few since there were only a few survivors of the bloody battle. It was during this horrific skirmish that the stocky and muscular Taylor earned the nickname “Old Rough and Ready” – a moniker which became popular later during his years in politics. It was also during this period of his life that Taylor was seldom at home and had to rely on family members and friends as well as acquaintances to help Margaret Taylor manage his lands and plantations. He knew that his military career made family life difficult, fervently hoping that neither of his daughters (two other daughters had died in infancy) would choose to marry a military man. In fact, when daughter Sarah was to marry Lieutenant Jefferson Davis (future president of the Confederate States of America) in 1835, Taylor exclaimed, “I’ll be damned if a daughter of mine will marry into the army!” Indeed, Davis resigned from the army prior to the wedding. Unfortunately, the marriage lasted only three months due to Sarah’s death from malaria. In 1845, serving as commander of the southern division of the U.S. Army, General Taylor was ordered by President James K. Polk to redeploy to the Texas-Mexico border to defend disputed land Mexico had lost during the clashes involving the Texas territory nine years earlier. It was during the subsequent successful war with the United States’ southern neighbor that Taylor gained the notoriety which had him compared to two other hero generals, George Washington and Andrew Jackson, and propelled him in the minds of the Whig party as a viable candidate to occupy the White House as President of the United States. 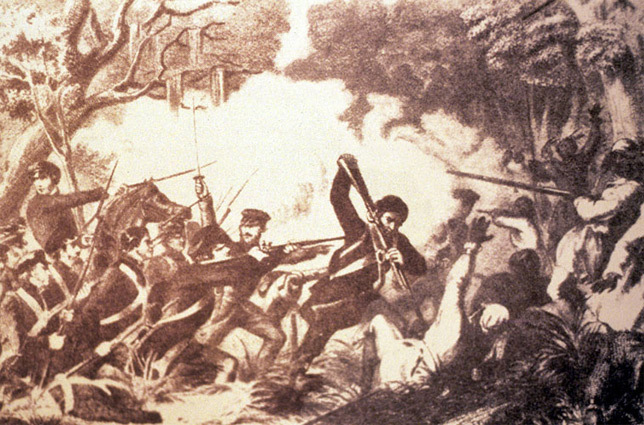 This 19th Century illustration depicts the Battle of Lake Okeechobee, which took place on Christmas Day in 1837. During the battle, Zachary Taylor commanded his men against the Seminole natives in the Florida swamp land. The overriding issue during Taylor’s stint in the White House involved the sectional dispute over slavery and the issue of keeping the North-South slave dispute from boiling over. Although Taylor had slaves at his Louisiana plantation, he wanted both California and New Mexico to be admitted to the Union as free states. In a message to Congress on Christmas Eve, he reminded them that he felt their first obligation was not to the cause of slavery but to the interests of their country. This stance angered southerners and ensured that the White House would not be receiving any Christmas cards from them that year! By the summer of the following year, during the final stages of the eventual agreement on the issue which became known as the Compromise of 1850, President Taylor died. At a ceremony on the 4th of July connected with the building of the Washington Monument and celebrating the 74th birthday of our country, the President drank a large amount of cold water along with cherries and iced milk to help overcome the high temperatures. After contacting gastroenteritis and suffering from a high fever that night, Taylor passed away four days later from a reported coronary thrombosis. After a eulogy given by future president Abraham Lincoln, President Taylor was buried in Louisville, Kentucky, at a location which is now known as the Zachary Taylor National Cemetery. His Vice President, Millard Fillmore, became the 13th President of the United States. That was a very interesting story, it seems like people who lived in his era had much more difficult time with life issues. I always thought the current generation had it harder, but apparently not. Nevertheless, I’m glad to be alive now instead of then! It’s really amazing how they can perform forensics on someone who passed in the 1850s. The political world is filled with conspiracy theories and this is another one to add to the list. I marvel at the technology of the modern world and the information they can figure out. I enjoy these biographical sketches that give a little information on a president’s family as well as his career. I don’t think that sending Christmas cards was a common practice back then. Most families and friends were able to get together at holidays and I think they were more private in their celebrations not sending cards, etc. to everybody they knew but communicating in person and by letter. Having read several of these Presidential blogs I am shocked at how many lost their lives as well as their children’s lives so early. In this day and age we are all so used to vaccines and medications that the thought of dying from such illnesses wouldnt even occur to us. Interesting fact that they were able to exhume his body so many years later. I had never heard that.